Do we want to reestablish the entire site? Do we want to modify it? Do we want to add or subtract anything? The answers will eventually be determined. The site was originally intended for hikers; especially for those interested in long distance hiking. A lot of the information here was and is aimed specifically at people who intend to hike (or who have already hiked) one of the long trails, whether the Appalachian Trail, the Pacific Crest Trail, the Continental Divide Trail or Canada's Great Divide Trail. But information is fragile and unless kept up to date and accurate, becomes useless. Thus some sections of the site have been at least temporarily deleted. There are now information sources that were not available when we originally produced Spiriteaglehome. The Thruhiking Papers are still here and will be updated periodically. Bun Bun will remain and will likely be expanded. Our Trail Journals and the Archaeological pages are personal and are the main reason we're putting the site back up. They will reappear over the next month or so. Other sections "may" reappear later - that has yet to be determined. Over the past few years, our interests have grown to include other ways of exploring the world as well. We both have always been fascinated by history, by other cultures and by different ways of looking at the world. 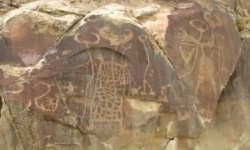 That interest has focused on Native American history, in the form of rock art (petroglyphs and pictographs) and archaeological sites (Indian mounds, cliff dwellings, etc.) We've visited hundreds of archaeological sites in our attempt to understand the people who lived here long before us. This has taken us to some really interesting and exciting places, as widely separated as Florida and Alaska; as California and Newfoundland. As outdoor people, we also love to get as close as possible to the natural world. Primarily this means looking for, watching and photographing wildlife and the beauty of the wilderness and its denizens. Many of the places we've been combine our two major interests - hiking and archaeology - because some of the best sites are located in the backcountry, well away from paved roads and/or civilization. If your interests coincide with ours, then welcome. If you're not a hiker, or if you're not interested in history and archaeology, then you can at least look at a few pretty pictures. In any case, we hope you enjoy what's here. We have enjoyed putting it together.